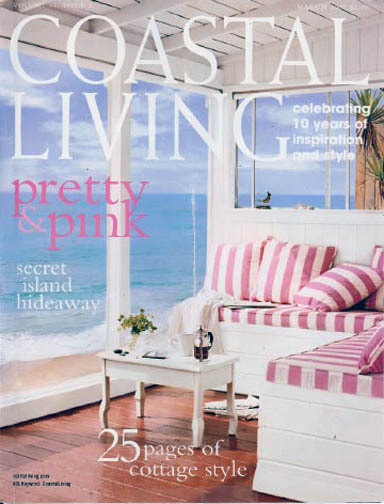 Celeste was featured in the March, 2007 issue of Coastal Living. Celeste Wegman, of Ephraim, was selected by the editors of “Coastal Living” for a feature-length story about interior design. The article sourcing Celeste is accompanied by color photography and included in the March 2007 issue of “Coastal Living,” a national magazine. Celeste is an interior designer and owner of Celeste Wegman Interiors, Ephraim. In a feature story, written by the magazine staff, Celeste discusses the decorating style, furnishings and finishes for a home she designed on Bald Head Island, N.C.
Bald Head Island is the southernmost of North Carolina’s Cape Islands. People access the island via a two-mile ferry ride from Southport, N.C.
Over the course of a year, Celeste made trips to the island to work in partnership with her client. There, she used decorating techniques to reflect the homeowner’s interest in a healthy home environment. “The home is a place to go to enjoy the beauty of nature and the tranquility of an island with no cars. It’s a place where they can bring family and friends and relax,” Celeste said. With more than 30 years of interior design experience, Celeste has decorated homes in a variety of styles ranging from cottage and traditional to eclectic and contemporary. She serves people who reside on the Peninsula as well as areas beyond. “And each home I decorate is different, like it is autographed by the homeowner. My signature is second–not first in projects. That makes me so very different,” Celeste said of her design philosophy. Celeste Wegman Interiors and City Farmer, a home and garden store, were established by Wegman and her husband, Richard Wegman, in 1997. And in May, the design studio relocated from the City Farmer building to a larger space in Ephraim at 3064 Church St. in 2008. “We are very proud to be part of historic downtown Ephraim and will contribute to heritage of the community,” Richard Wegman said. For more information about Celeste Wegman Interiors, visit the studio located 3064 Church, Ephraim, call 920/854-7522.